Located in the heart of Salalah, this hotel is 0.2 mi (0.3 km) from Salalah Gardens Mall and 2.2 mi (3.6 km) from Salalah Park. Al Husn Souq and Land of Frankincense Museum are also within 9 miles (15 km). 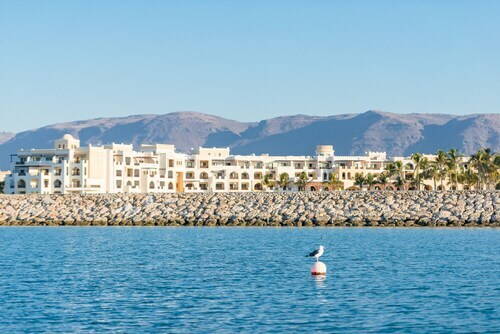 Located by the ocean, this family-friendly resort is within 6 mi (10 km) of Land of Frankincense Museum, Al Husn Souq, and Al Baleed Archaeological Site. Salalah Gardens Mall and Salalah Park are also within 9 miles (15 km). 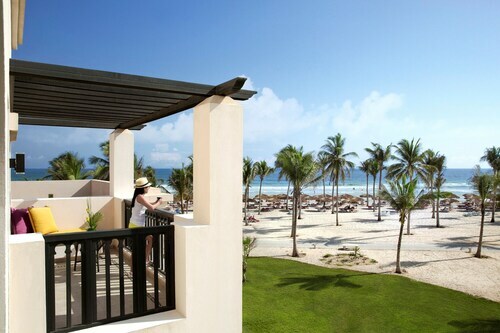 Located in Salalah, this beachfront hotel is in the entertainment district, 7.7 mi (12.4 km) from Taqah Castle, and within 16 mi (25 km) of Sumhuram Archaeological Park and Land of Frankincense Museum. Al Husn Souq is 15.3 mi (24.6 km) away. 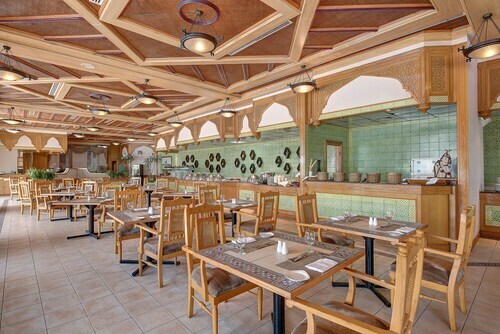 Situated in Salalah, this hotel is within 3 miles (5 km) of Al Husn Souq, Salalah Park and Salalah Gardens Mall. Land of Frankincense Museum and Al Baleed Archaeological Site are also within 9 miles (15 km). 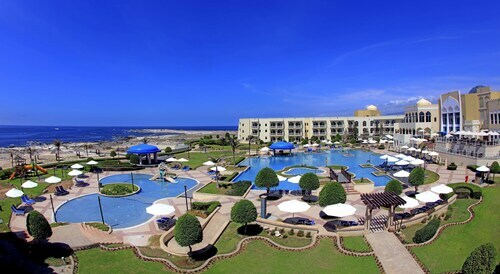 Nestled on the beach, this Salalah resort is within 3 mi (5 km) of Salalah Park, Salalah Gardens Mall and Al Husn Souq. Port of Salalah and Land of Frankincense Museum are also within 9 miles (15 km). Nestled on the beach, this Salalah hotel is 1.3 mi (2.1 km) from Land of Frankincense Museum and 1.8 mi (2.9 km) from Al Baleed Archaeological Site. Al Husn Souq and Al-Saada Stadium are also within 6 miles (10 km). This Mirbat resort is on the beach, 5.4 mi (8.8 km) from Tomb of Mohammed Bin Ali, and within 32 mi (52 km) of Sumhuram Archaeological Park and Taqah Castle. 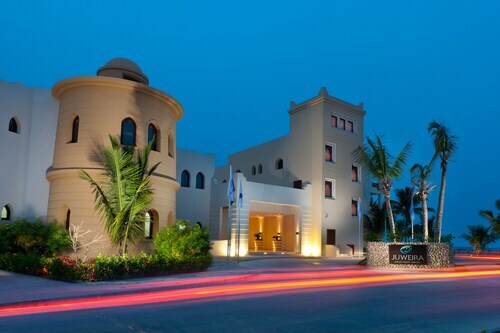 Nestled on the beach, this Salalah hotel is within 6 mi (10 km) of Salalah Gardens Mall, Port of Salalah and Salalah Park. Al Husn Souq and Land of Frankincense Museum are also within 9 miles (15 km). So, you're thinking about travelling to Salalah? If you want to find accommodation that's located close to the sights, you can enter your holiday dates and then use the filters next to your hotel search results to find a hotel near the area's attractions. You can choose among 48 Salalah hotels and accommodation options to find a place to stay. 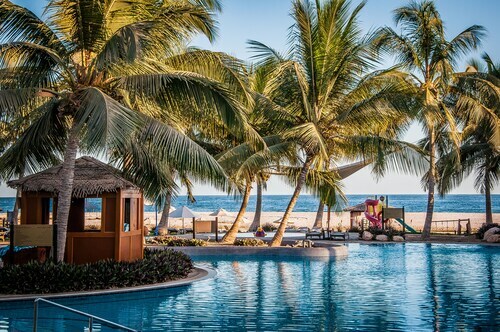 When you're deciding where you'd like to stay in Salalah, you'll be able to quickly and easily search ebookers for hotels that offer services such as high-speed Internet, free airport transport or a swimming pool. You can use the filters to narrow down your hotel search, so you get the services that are important to you, such as air conditioning or an in-room kitchen. When making plans for your holiday in Salalah, you can also use ebookers to search for a convenient flight to Salalah (SLL) Airport. You can narrow down your search by number of stops, airline or departure time to identify one that'll work best for you. When is the Best Time to Explore Salalah? If you're wondering when is the best time of year to explore Salalah, you might find this info about seasonal weather useful when you are planning your trip. The warmest months in Salalah are typically May and June, whereas the coldest months are usually January and February. The months with the most rain are August and October, whereas October and February have the least. From January to March, the average daytime temperature is 31°C and at night it is 18°C. Seasonal average rainfall is 0 mm. If you visit between April and June, you can expect an average temp of 33°C during the day and 23°C at night. Average rainfall during this season is 0 mm. The daytime average temp from July to September is 31°C and the nighttime average is 23°C. Average precipitation for this season is 1 mm. Between October and December, the average temp during the day is 31°C and 19°C at night. Seasonal average rain is 0 mm. The annual rainfall average in Salalah is 1 mm. Espaces silencieux, Sourire gentil et acueuil professionnel. Petit déjeuné gargantuesque, Wi-fi parfait dans les chambres. pour le paysage il faut regarder la mer et le jardin/piscine de l'Hôtel. les alentours sont désert ou presque, en attente de construction. la prochaine fois que je vais à Salalah, c'est ici que je crécherais. Die Unterkunft hat sehr viel zu bieten. Obwohl die Anlage riesig ist und somit auch viele Gäste beherbergt kommt man sich mit diesen nicht in die Quere. Möchte man etwas auf der Anlage kaufen, ist dies sehr teuer (obwohl man schon relativ viel für den ganzen Aufenthalt bezahlt). Mitarbeiter waren zum Teil unfreundlich und konnten sich nicht weiterhelfen wenn man eine Frage hatte - somit musste der Gast die Frage selber beantworten. Good hotel with a great beach, very nice rooms and good food & service. But Al Baleed Resort is very much oriented to families and not for a romantic trip for a couple. Gutes Hotel für eine Nacht. In der Nähe des Flughafens. 5.0 Great staff, service and location !! Caring staff to the details, they are there to ensure comfort, will definitely come back there !! 3 years ago by Peter R.